I try to cook with turkeyoften as an alternative to chicken to stay out of the red-meat-zone. Unfortunately, I have no idea how to cook with large pieces of turkey, so I usually opt for ground turkey. Some recipes I use ground turkey for include meatloaf, burritos and chili. Basically, anywhere you can substitute for ground beef. This meatball soup is really nice! 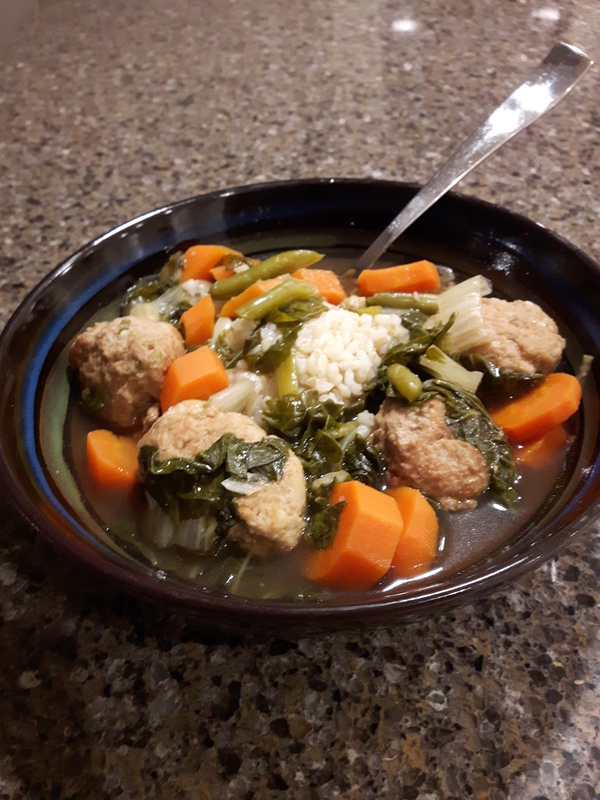 I love it because it is hearty and fills you up as a whole meal, but when you break it down it is actually very light – brown rice, vegetables and ground turkey meatballs. In my opinion, the two reasons why this soup is so nice is 1) the meatballs are browned in a frying pan and then cooked in the broth, making them nice and succulent, and 2) the soy sauce in the broth makes it oh so satisfying. Cooked white or brown rice for serving. Combine all meatball ingredients in a bowl and mix well. To help meatballs stick better, throw mixture against bottom of mixing bowl repeatedly until mixture sticks together nicely. Heat oil in a skillet on medium heat. Cook meatballs, flipping at least once and stirring, until browned, about 5 minutes. In a soup pot, heat oil on medium heat. Sauté carrots for a couple of minutes. Add bok choi, green onion. Saute for a few more minutes. Add ginger, garlic and chili pepper. Saute for 1 minute. Stir in chicken broth, meatballs, green beans and 1 cup extra of broth if needed. Bring to a boil. Reduce heat and simmer, until meatballs are cooked, about 20 minutes. Stir in soy sauce and lime juice. Divide rice into 4 bowls, cover with broth, meatballs and vegetables.